The ARB 20" Intensity AR40 Series Spot Beam LED Light Bar Kit is a heat sink and light bar mounting system designed to improve light bar stability and driving vision. The spot beam pattern produces a very strong single beam down the road with narrow improvement to peripheral illumination. The pedestal mount is more versatile and allows you to attach the light bar to either the pan of your bull bar or a roof rack. All of the fasteners and components are made from stainless steel and are powdercoated for additional protection. The large aluminum extrusion body acts as a heat sink that draws heat generated from the light bar away from the LED array. This increases efficiency and the life of the LEDs. 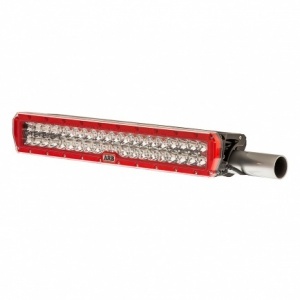 This watertight and dust-proof sealed light bar has been given an IP68 rating for protection against dust ingress and submersion up to 3 meters. This is thanks to a unique molded rubber seal that sits between the polycarbonate lens and cast aluminum body. The 3.5mm injection-molded polycarbonate and hard-coated lens provides scratch and UV-resistance. The cast aluminum body is built from corrosion-resistant materials and comes in a textured polyester powdercoat finish. The wiring loom includes a waterproof Deutsch plug, surface mount switch with LED indicator, and a heavy-duty 30 amp relay. Also available is an 16' extension wiring loom if you plan on mounting this light bar in further-to-reach locations that is sold separately. A replacement ARB Intensity AR40 Series Wiring Loom, ARB-3500810, is available for purchase. The ARB Intensity AR40 Series 16' Wiring Loom Extension, ARB-3500820, gives you the extra length needed to mount a light bar in further-to-reach locations. The ARB Driving Light Security Locknut Set, ARB-DLSP10 (10mm) or ARB-DLSP12 (12mm), provide additional protection to your ARB Intensity Light Bar.